Well, Gov. Rick Scott’s legal action against the shoddy ballot counting antics in two of the most liberal counties in the state seems to have clinched its first win: A Florida judge ruled that Broward County, the largest Democratic county in the state, was in violation of state law, and that Brenda Snipes, the county’s elections supervisor, was in violation of open records act. Ms. Snipes was not giving regular updates on how many outstanding ballots were left. She was just dumping vote counts in the late hours, which has chipped away at Scott’s lead, but the secrecy and the timing was suspect. Why is Broward taking so long? Hurricane Michael-ravaged counties have been able to count their ballots on time. Now, she must comply with records inspections by 7 P.M. In Broward County for emergency hearing in Rick Scott v Broward SOE Brenda Snipes. Hearing hasn't started yet, but judge is Carol-Lisa Phillips. Attorneys for Scott say the case is simple, about access to info that the Broward SOE was required to provide. Snipes must allow immediate inspection of records - plus no spoliation of records requested - on or before 7 pm tonight. This is — what? 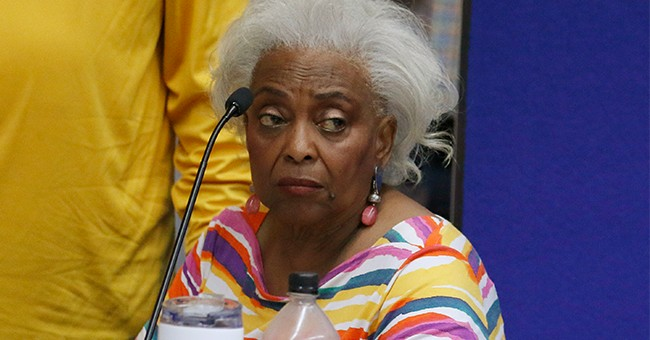 — the 3rd court ruling against Broward’s top elections official in as many years, I believe? Scott has already declared victory over Democratic incumbent Sen. Bill Nelson. At the time, he was ahead by a little over 34,500 votes. It’s now around 18,000. Scott has a lead of less than half of one percent, so lawyers have been pouring into the state—and this isn’t the first time Ms. Snipes has been either violating the law or straight up been total garbage at her job.